If your heart is set on a real Christmas tree and you prefer not to cut one down yourself in a national forest (or have run out of time to do that), you can still buy a freshly cut tree at locations throughout the Phoenix area. Many temporary lots show up around the area starting in late November; here's a list of some of the best places to find that gorgeous tree that's calling your name, just waiting to be dressed up in your favorite ornaments and illuminated with bright lights. Mast-Roth is a local purveyor of fresh Christmas trees and has been family owned since 1980. Mast-Roth sells fresh, thick, and wonderfully fragrant Christmas trees grown in Oregon that are from 3 to 14 feet tall. You can also find fresh wreaths there. Find Mast-Roth lots in Phoenix, Tempe, Mesa, and Peoria. At Moon Valley Nursery lots, you'll find noble, Douglas, and Fraser firs in sizes that range from 3 to 15 feet tall. Moon Valley also usually has live (as opposed to freshly cut) Christmas trees that can be replanted after the holidays. You can order your desired size and species from Moon Valley Nursery and have it delivered straight to your house. Moon Valley has Christmas tree lots in Surprise, Glendale, Peoria, Phoenix, Chandler, Mesa, and Scottsdale. Seasonal Farms is a Phoenix family business offering a variety of Oregon-grown fir trees and wreaths. Seasonal Farms has two lots in Phoenix, one in Gilbert, and one in Queen Creek. At Tim Mitchell's you can buy a fresh Christmas tree as small as 2 feet or as tall as 30 feet. And if you want service, this is the place to go. Tim Mitchell's will flock your tree if you'd like that, deliver it, set it up, and remove it. That is some deal if you love the experience of a fresh Christmas tree but think it is too much trouble. Mitchell's also has long-needled pine cone clusters and fir wreaths and garland. Tim Mitchell's has lots in Scottsdale and Gilbert. 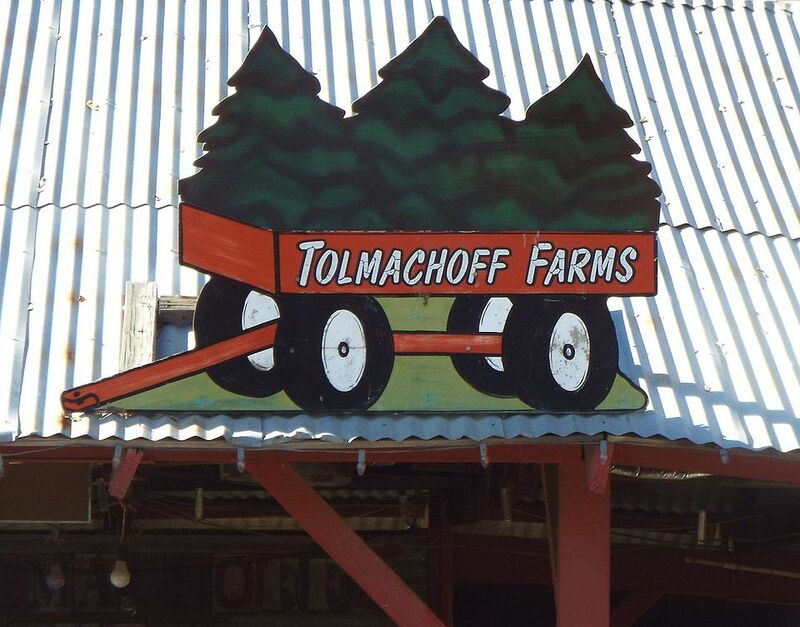 At Tolmachoff Farms, in Glendale, you'll get a full-on Christmas experience along with buying a tree. The farm has Douglas, grand, and noble fir trees for sale. While you're there, you might catch a glimpse of Santa wandering around, and you can warm yourself around the bonfire and buy hot chocolate, apple cider, kettle corn, and s'mores to nosh on. Valley View sells Oregon-grown top quality fresh Christmas trees with a large selection of noble, Douglas, Nordmann, and grand firs. The Christmas trees are kept under large white tents, which keeps the trees healthier. You'll find Valley View Christmas tree lots in Chandler, Tempe, Gilbert, Phoenix, Queen Creek, and Casa Grande. Vertuccio Farms, in Mesa, has been serving the Phoenix area since 1979 for all kinds of seasonal produce needs, including Christmas trees. In 2017, Vertuccio's announced it would not be selling Christmas trees because of a shortage of quality firs from Oregon. It said it planned on resuming sales of Christmas trees in the 2018 holiday season.